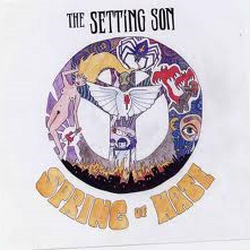 Spring of Hate the follow up to the self-titled debut album by The Setting Son which was released in 2007. The album is quite different compared to the debut album. Main songwriter Sebastian T.W. Kristiansen has obviously grown older and found a steady group of band mates that makes “Spring Of Hate” sound more like the work of a band than Sebastian with a hired backing band as was the case when the first album was recorded. The songwriting of Sebastian T.W. Kristiansen has become more varied this time. “Soulmate”, the first single from the album, is a catchy song with an amazing chorus that goes straight to the brain as the perfect blend of psychedelic pop and garage rock. “Girl of Sorrow” showcases the melancholic side of the band while “I Lost Control” is desperate and angst-ridden. The references to garage rock from the 60′s, psychedelic pop and surf are clear but it seems that The Setting Son have their own take on neo-psych anno 2009. The strange but addictive vocals of Sebastian T.W. Kristiansen just underline that fact. “Spring of Hate” is produced by Lorenzo Woodrose in Black Tornado and is mixed by Johan Gellett at Studio 73. Originally released 20.04.09 on LP, CD and as Download.